Angela Merkel keeps pushing for a European solution to the refugee crisis, but discord remains. From Athens to Stockholm, the warning is the same: it’s not the influx of refugees that threatens the EU’s Schengen area of passport-free movement, but the refusal of EU member states to work together and share the burden. But forging a continent-wide solution, a central plank of the German Chancellor’s policy, has proven an elusive task. Observing Europe’s ongoing refugee crisis, there’s a German phrase that sums it up: “Wenn jeder an sich denkt, ist an alle gedacht” – if everyone thinks of themselves, then everyone is taken care of. That kind of unpleasant, self-satisfied logic has been spreading throughout Europe, and for me sums up the state of play in the continent’s refugee crisis: a real-life board game that mixes up dominos with snakes and ladders, with mesh and barbed wire fences cutting through the middle. Everyone is thinking of themselves because no one is thinking of anyone else. Earlier this month, I was invited on an Irish radio program to discuss Sweden’s decision on January 4 to impose ID checks on its borders, effectively ending half a century of free travel in the Nordic region. With ill-disguised glee, the Irish radio host asked whether Swedes were annoyed with their government for biting off more than they could chew. I said that I had encountered growing frustration with the government, but the greatest annoyance among Swedes was directed at Sweden’s EU neighbors for refusing to share the load and forcing this ignominious climb-down. The Swedish border checks have prompted a domino effect: Denmark has stepped up spot checks to Germany, which in turn has extended its own checks to Austria. In addition, Germany is sending a few hundred asylum seekers back over the border to Austria daily. Last week Austria announced that it, too, is unable to cope and, like Sweden, has been forced by others’ inaction to act. After accepting 90,000 asylum applicants last year it will cap applications at fewer than than 40,000 this year – dropping annually to 2019 – while allowing passage to Germany to anyone who wants it. The knock-on effect is palpable further down the Balkan route: borders are closing then opening again, but only for selected nationalities, and only if they are in transit to Germany or Austria. The consequences of Vienna’s action will become clear in the spring when migrant traffic on the Balkan route picks up. By then, Vienna is hoping the pressure will have forced a real burden-sharing agreement in Brussels. It’s a high-risk strategy that may work – but the consequences of it not working are too terrible to contemplate. Austria’s national decision upped the pressure on German Chancellor Angela Merkel to prevent another million asylum seekers arriving this year, on top of the same number that arrived in 2015. Calls for Germany to close its borders reached a crescendo on Wednesday last week in the snowy Alpine retreat of Wildbad Kreuth. Here Angela Merkel felt the full fury of the Christian Social Union (CSU), her Bavarian allies, on Germany’s migration front line. Even in the depths of winter some 2,000 people are still crossing daily into Germany. Of 70 border crossings with Austria, they said, just five are manned. After Austria’s decision, they said, this madness had to end. Markus Söder, state finance minister and Bavarian leader in waiting, told the chancellor that opening German borders last August to Syrians trapped in Hungary was the humane thing to do – but it was a mistake not to respond to the resulting misunderstanding that Germany was open to all. The CSU politicians tried everything on Merkel, from flattery to threats, but the lady was not for turning. The only credible solution she sees to this crisis is a European mechanism to redistribute asylum seekers throughout the bloc. Anything else is just cosmetic. Austrian-style asylum caps or Swedish-style border checks were out of the question for Germany, she added, because such actions by the EU’s largest member state would cause a humanitarian disaster in the Balkans and trigger the end of the European Schengen zone – if not worse. Her problem is that the success of her migration plan hinges on the goodwill of countries that are not card-carrying members of the Angela Merkel fan-club. Turkey has little love for the German leader, the loudest European opponent to its EU accession. Ankara is key to Merkel’s plan to reduce numbers – and knows it. 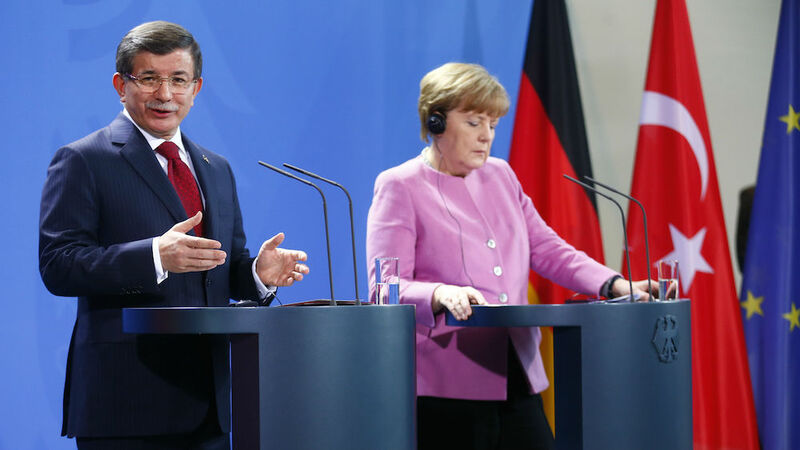 The Turkish government, in Berlin last week for bilateral talks, has accepted €3 billion in EU funds to encourage refugees to stay closer to home. But that €3 billion is mere “hello” money, its officials say: they want another €7 billion more to keep refugees in the region. Then there’s Greece. Its efforts to set up refugee registration and redistribution “hotspots” on its outer EU border are so behind schedule – end of February is the new deadline – that increasingly paranoid Berlin officials wonder if this isn’t a Syriza go-slow to pay back Berlin for its euro crisis strategy. Greek ministers deny such conspiracy theories and concede there have been set-up problems. But the biggest challenge in the long term, they say, is the growing list of reasons why EU member states refuse to take migrants – or reserve the right to choose. Greek migration minister Yannis Mouzalas complained in Berlin last week of EU countries who “only want Christians or big blond Syrians with blue eyes and degrees.” It’s not this influx of migrants that will break the EU’s Schengen area, he suggested, but the refusal of member states to work together to share the burden. From Stockholm to Athens, the warning is the same, but the discord remains. That discord will only become more urgent in talks to reform the Dublin Regulation, which obliges people to register for asylum in the first EU country they enter. This is the dilemma facing Angela Merkel: how do you put together a pan-European solution to a crisis, the only kind she feels can work in the long term, when almost none of your partners are interested? Worse, how do you strike a migration deal with EU countries whose inaction is motivated not just by self-interest but by the unspoken, simplistic migration crisis argument: you broke this Angie, you fix it. As Europe’s coalition of the unwilling grows, and shutters come down across the Schengen bloc, Merkel’s nightmare scenario is that all asylum roads will lead to Germany. Public opinion here on asylum is still evenly split. But that won’t last forever – particularly with feelings running high after the Cologne attacks involving asylum seekers. In Chancellor Merkel’s ruling Christian Democratic Union (CDU), even her most loyal allies are getting nervous. With three state elections looming in March – and migration a massive local issue – pressure is building daily for Merkel to secure a noticeable and sustainable reduction in inward migration to Germany. Last week she hinted that, if no real deal emerges after the February EU summit, she will have to revisit her migration policy. That would be a huge political climb-down, but the alternative is to do nothing and watch voters pummel her CDU in March – and, by extension, her authority as party leader.